JOE BRADLEY opened a show of beautifully minimal and yet totally resonant and ‘animated’ paintings at CANADA, NYC. 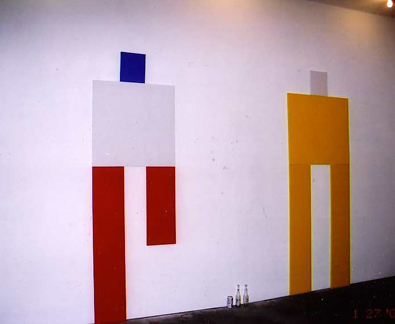 Titled ‘Kurgan Waves’, the show opened on January 27, 2006 and ran until March 4, 2006.
this photo was taken at the opening, hence the beer bottles on the floor. 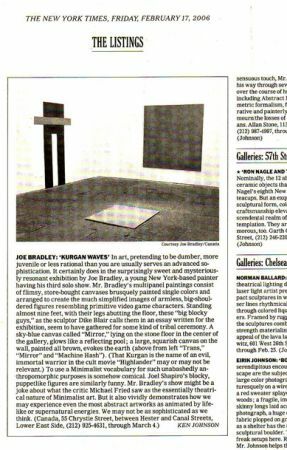 ‘KURGAN WAVES’ garnered JOE BRADLEY a highlighted review (with an image) in the FRIDAY FEBRUARY 17, 2006 NEW YORK TIMES. Written by KEN JOHNSON, the review appeared on the prestigious THE LISTINGS page. this is a visual scan of the NEW YORK TIMES article.